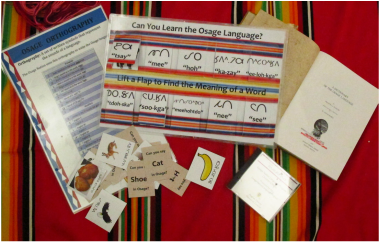 Osage Language DVD: The Osage Nation produced this Osage language primer for Osage children. Elementary-aged children as well as older individuals will enjoy learning from this video. A portable DVD player is included in the trunk. Osage Orthography Poster: An orthography is a set of written symbols that represent the sounds of a language. The poster shows each symbol, and the sounds it represents, in the Osage orthography. Language Flash cards: On one side, each card has a word written in Osage orthography, the English transliteration of that word, and a picture indicating the meaning of the word. The other side has the English translation. Osage Language Board Game: The board has 10 flaps. The top of each flap has a word written in both the Osage Orthography and English transliteration. When one lifts the flap, she or he sees the English translation and a picture indicating the meaning of the word. ​A Dictionary of the Osage Language by Francis La Flesche. Indian Tribal Series, Phoenix, Arizona, 1975 (Originally published in 1932, Smithsonian Institution, Bureau of American Ethnology Bulletin 109, US Government Printing Office, Washington D.C.).